I was born at no. 12 Homewood Cottages on Shorne Ridgeway and was still living there during the war years. Living where I did, I used Tanyard Hill to get to Shorne Village and hardly ever went into Woodlands Lane so do not have much knowledge of that area during the war but I may be able to help with some information on the surrounding area. One thing I do know is that the trucks with the anti-aircraft guns on the back were always parked facing Woodlands Lane, presumably for a quick getaway in the case of an air raid. The anti aircraft guns that were on the back of the trucks were Beaufort guns that were loaded with a five shell magazine, which meant that five shells could be fired in quick succession. I did go to look at the aftermath of the V1 explosion, only one of the Nissan huts was totally destroyed and the others damaged to a lesser extent, there was also damage to properties over quite a large area. There were several houses in the area taken over by the army; Puckle Hill housed ATS and soldiers from the rank of sergeant upwards. I knew one of the ladies that was billeted there but when I asked what they did she replied “I’m sorry but I’ve no idea, I’m just a cook”. The Canadian Army officers were billeted in Pondsfield Lane, one of the Canadians jobs was manning the anti aircraft guns in the area. I know there were anti-aircraft gun sites in Cobham, behind the War Memorial, Higham in Dillywood Lane, Denton, roughly where the industrial estate at the end of Rayfield Road now is, and at The Tollgate but I don’t know which ones the Canadians manned. One of the garages in Pondsfield Lane had been turned into a supplies room for supplying rations to the gun sites in the area. My mother used to do their laundry and I had the job of returning it when she had finished. One day one of the soldiers called me and asked if I’d like some cheese, to which I of course replied “yes please”. By this time cheese was quite heavily rationed and we were allowed a very small amount, which I think was 2 ounces a week, so imagine my surprise when he gave me a bit that was easily equal to two weeks ration. I sat down and with great glee polished it off there and then. I can’t remember what regiments were in the area except for the Durham Light Infantry who were there for a short time and I think I only remember them because they had a plume in their beret. My father had a market garden in the triangle of ground called Racefield, made by the junction of Tanyard Hill and Woodlands Lane, one day a string of bombs fell and one landed in the field, it must only have been a 50lb bomb as the crater it mad was only a few metres across. Incendiary bombs were falling all over the place but we didn’t used to really take any notice of them. Anderson or Morrison shelters were not issued to people living in the country as they weren’t seen to be at such a high risk as people living in the towns. On that basis I don’t suppose it was strange that children were evacuated from the Medway Towns to Shorne! We built our own air raid shelter on the piece of green at the top of Tanyard Hill in between the seven chestnut trees that were growing there. We dug a hole about six feet square and six feet deep, lined it with timber and put chestnut stakes around it, we then trollied six to eight, twelve inch diameter, fallen ‘’corrugated iron sheets and covered the whole thing with about three feet of earth, leaving an entrance/exit at either end and we didn’t use it very often, it was really unpleasant very earthy and damp, we rarely stayed in it any longer than it took to have a cup of tea. There used to be quite a large chalk pit alongside Thong Lane; that people used as an air raid shelter which was filled in when the development of the area started in the 1960’s. On New Years Eve 1943, I was ploughing when I heard a terrific roar of an aeroplane clearly in distress. The plough horses frightened by this broke into a gallop which I was able to bring under control. I went to look over the hedge and saw that a plane had come down in the field opposite The Crown Garage, now a car sales. I joined one or two other people who were running towards the plane and helped dig a hole so that we could get the pilot out as the cockpit and front of the plane were upside down although the rear half was the right way up (see the picture below). The pilot was still strapped in so I used my penknife to cut him free, he was taken to Gravesend Hospital where he was found to have a broken arm, broken rib injury and a nasty gash to his head On it’s way down it had hit several pole carrying the electricity supply to several properties nearby leaving them with no power for any New Year celebrations. 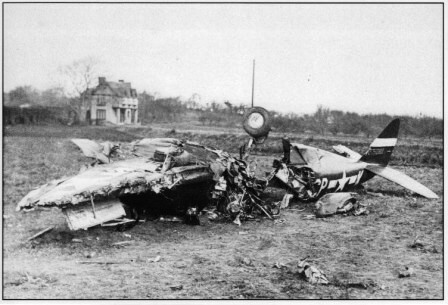 The photograph shows the plane but it had more damage to it than subsequent to the crash. I later visited him in hospital and he confirmed he had run out of fuel on his back to East Anglia and had tried to land on the road, not knowing that the Gravesend airfield was only a couple of miles away. There were no barrage balloons in the area, before D Day, as up to that time Gravesend Airport was a fighter plane base and it would have been too dangerous for the planes coming in and out. During the war I was an army cadet, with the Cobham troop and my father was a Special Constable whose duties included patrolling Shorne village. I only know of three soldiers from Shorne who were taken POW, They were Owen Noon, Les Parish and Smith, whose first name I can’t remember. (Information from Ben Parish: there was also Jack Vaughan). Whist Drives were held in the village hall in aid of our POW’s and it was at the same time that my mother became one of the first voluntary cleaners at Shorne Church. This entry was posted in Oral History and tagged shorne woods country park, social history, world war II. Bookmark the permalink.